2012 Mercedes A-Class preview - updated | What Car? The new Mercedes-Benz A-Class goes on sale in the autumn, packed full of advanced technology, but with prices similar to the current models. The 2012 A-Class is a very different car from the current A-Class. Mercedes believes the latest B-Class now fulfils that brief, so it has restyled the A-Class as a regular-sized premium hatchback. Its aimed squarely at the new Audi A3, BMW 1 Series, Volkswagen Golf and Volvo V40. The A-Class is 4292mm long, 1780mm wide and 1433mm high so its around the same width as the latest Audi A3, but 6cm longer and 1cm taller. It will be launched as a five-door, although a sportier three-door variant is due in 2013. The petrol engines at launch will be 1.6- and 2.0-litre motors; all of them turbocharged. The 1.6s are the entry-level 121bhp A180 and the 154bhp A200. The 2.0-litre A250 has 208bhp. Later on, a four-wheel-drive AMG version of the car will have a 2.0-litre engine with more than 300bhp. All engines will get a stop-start system as standard. They'll be paired with either a six-speed manual gearbox, or a new seven-speed dual-clutch gearbox that Mercedes calls 7G-DCT. The new 1.6 petrol engines have Mercedes new Camtronic system, which adjusts the valve lift to provide maximum efficiency. Weve driven both, in prototype development vehicles, and found them to be impressively flexible and lively. The entry-level diesel model will be the A180 CDI, which has a 107bhp 1.5-litre Renault-sourced engine, as part of a technology-sharing agreement between the two brands. Mercedes fits a number of its own parts to the engine, including its own engine stop-start system, alternator and changes to improve refinement. Its available with a six-speed manual gearbox only and produces CO2 emissions of just 98g/km. An eco version with mechanical tweaks and different oil will arrive shortly after the standard version, and is likely to have CO2 emissions closer to 90g/km. Therell be another A180 CDI, which uses a 1.8-litre version of Mercedes familiar 2.1-litre four-cylinder diesel engine also with 107bhp and comes with a 7G-DCT gearbox as standard. It has CO2 emissions of 109g/km. The A200 CDI has a 134bhp version of the 1.8 diesel engine, while the A220 CDI has a 168bhp 2.1-litre engine and the new 7G-DCT seven-speed dual-clutch gearbox as standard. The new A-Classs dashboard looks similar to the impressive design of the recently launched B-Class, with circular air vents similar to those first introduced on the SLS supercar and a large central audio system. The infotainment system, which has a floating screen at the top of the dashboard, can be tailored to include full iPhone integration Mercedes says it will offer this feature for other smartphones shortly. Mercedes hopes the technology, which involves hardware called Digital Kit Plus and a Digital DriveStyle App, will appeal to a younger generation of drivers. Audi A3 and BMW 1 Series buyers are being targeted. The new system has social media at its heart, providing virtually complete connectivity with the user's iPhone, including access to Facebook and Twitter accounts, contacts, SMS, email and music library. It also has personalised internet radio, which works in a similar way to Apple's Genius tool, allowing you to choose music by genre or artist, and listen to recommended playlists based on personal taste. Navigation is catered for by Garmin mapping and internet-streamed traffic updates. Further functionality comes in the form of Siri-style speech-recognition, a feature of the iPhone 4GS, which allows users to use conversational language to make calls, arrange appointments, and check the weather, news or even stock prices. 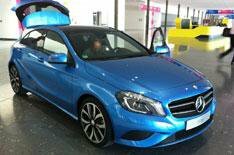 The digital media system will be available on the new A-Class as an option, and is expected to cost around 150. Mercedes hasnt released prices or specifications yet, but it has confirmed that the A-Class will be cheaper than the B-Class, so the entry-level model is likely to cost around 20,000. Full details are likely to be revealed in August, when customers will be able to order the car. First deliveries will be in September. Theres likely to be a choice of SE and Sport trims. Sport models have a range of cosmetic tweaks, including AMG styling details such as a new grille and 19-inch alloys. This trim is likely to be restricted to the A250 and A220 CDI. Mercedes says it has installed many of its big-car options on the A-Class; itll get Attention Assist (which monitors driver fatigue), radar-controlled collision prevention, a brake hold function and hill-start assist as standard. Other optional features will include adaptive headlights, blindspot assist, lane-keeping assist, speed limit assist (with speed sign recognition) and active parking assist.